Is Volunteering the Emperor's New Clothes? It’s good news that high-ranking people are talking about volunteering in all sorts of public forums. The bad news, however, is that each corporation and national organization wants to "wear" volunteerism…for only a moment. They brand a new initiative, launch an independent Web site, and promote their effort as the most desirable. The glitz of each launch most often ends up as a "flash in the pan," with very little impact on any of the important community work that needs to be done. Why is volunteerism up for sale and up for grabs like summer’s most popular fashion? Maybe it’s because service is an easy platform for corporations and institutions to gain a halo effect merely by stating a commitment to community involvement – with no risk of being held to promises made or even having to report back any activity at all. Shouldn't high-profile volunteer promotions be held accountable by someone? It won’t be by the large nonprofits that happily take the corporate funding to underwrite other work. It won’t be the mass media that aids and abets the hype in their news coverage. So what about those of us who recruit and coordinate volunteers on the front line? We need to protest when the emperor has no clothes. 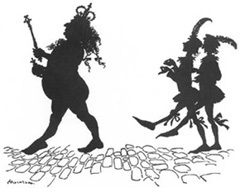 Image from Fairy Tales by Hans Christian Andersen. Arthur Rackham, illustrator. Right after the 2009 Serve America Act many volunteer-related initiatives were launched in the United States (and around the world). Let’s revisit some of them and see what happened. We saw three really big campaigns: the "Scoop It Forward" ice cream give-away run by Ben & Jerry’s, VolunteerMatch, and Target stores; the Starbucks exchange of free coffee for 5 hours of service; and the "Give a Day, Get a Disney Day" campaign that urged people to volunteer for a single day to get a free ticket to a Disney theme park (it ended abruptly when all one million available tickets were distributed in two months). Can anyone tell me what actually was accomplished in a real-life organization by an actual volunteer as a result of these very visible campaigns? At the 2009 National Conference on Volunteering and Service, the Entertainment Industry Foundation (ELF) committed to mobilizing the entertainment community "around a groundbreaking initiative designed to inspire a new era of service and volunteerism." We were supposed to be flooded with mentions of volunteering in TV shows and movies, but that effort fizzled out almost immediately. ELF created its own Web site and brand,"iParticipate," to publicize what celebrities are doing. Today it has lots of celebrity photos but no substance. Has anyone questioned why this effort failed, or asked Points of Light to follow up in some way? Alan Khazei, founder and CEO of Be The Change, Service Nation, and co-founder and CEO of City Year, started VOLiNTEER—the "i" is for "international"—self-described as "a new global volunteering network." The trouble is that two years later the site is still only one page. CITGO created the program Fueling GoodTM to give away "gas and lubricant prizes to the most deserving charities" and to stimulate volunteering. In 2009 they tried to link people to volunteering opportunities; now in 2012, the project has shrunk to an online competition through which only 24 winning charities share in a mere "$120,000 in gas prizes." The social networking site BlackPlanet.com created "BlackPlanet Rising" to encourage and assist its members to: "Champion a Cause. Change Your Community." I couldn’t find any mention of that effort anywhere on the Web today. A Billion + Change has been touted for three years now as an outstanding effort to get corporations to pledge a billion hours of employee volunteering to help nonprofits. Its mission is commendable, but all the focus is on getting the pledges from companies. Their Web site does not even include a section directed at nonprofits, so how does someone in a local community learn how to draw down on those promised hours? And why no examples of the volunteer work being done? I could keep going, but you get my drift. Chase, the official economy track sponsor, hosted "Civic Service, Helping to Drive Economy Through Action." How does all of this expense and promotion actually further volunteering or have a real impact on the needs of society? Is the emperor wearing any clothes? The crux of the matter is that almost all of these initiatives lack clear goals. Are the promoters attempting to increase volunteering for volunteering’s sake, no matter how insignificant the service may be? Or do promoters want to make a difference in our world through progress on a cause or help to individuals in a time of need? While urging people to volunteer, these campaigns have no strategic focus on the results of the service being pledged or sponsored. There is nothing wrong – and actually quite a bit of good – in many voices repeating the invitation to get involved. But if our goal in the volunteer community is to increase and sustain volunteering over time, promotional campaigns must go beyond hoopla to legitimacy. We can hold them accountable. Share your experiences with any widely-promoted project. If it was a successful venture, let the rest of us know. Explain how you managed to be part of the effort and whether others can still be. Or, express your disappointment that your attempt to connect your organization to a project didn’t work out. Select a few current campaigns or initiatives to follow over the next year or so. Pay attention to news releases about them, visit their Web sites regularly, and so on. Try to make use of what they offer: see if you can post a volunteer opportunity or request the promised service. If it works, praise the organization publicly on its Web site and to the media. But if it doesn’t, go public, too. If a large company has proclaimed its branded day of service at the national level, contact the branch or office closest to your organization and ask what they will be doing locally. Offer to help as a site for volunteers. See if they are prepared for your outreach. Again, go public with the good and the bad. Keep track of newspaper and television reporters who are assigned to cover the early publicity of new volunteering initiatives. Write to them every six months, asking them to do a follow up story on what has happened. The reporter will be flattered that you remembered his or her work, and might be intrigued at the potential of a story that either is more "good news" or (even better, to them) an "exposé"! With 5400 people at the June National Conference there was very little possibility that people who share the same concerns were able to find each other, let alone connect. I followed the #NCVS hashtag on Twitter and expanded my network a little. Now I'm hoping that people interested in what you're writing about will host groups on Google Hangout and other places where we can find and connect to each other. For those who are in the Chicago region and care about this I encourage you to participate in the Tutor/Mentor Conference I'm hosting on Nov. 19. I've done this every six months since 1994 in an effort to support long-term volunteer involvement in tutor/mentor programs all over the Chicago region. Let's connect and find ways to innovate new ways to draw volunteer and donor attention and participation in a wider range of volunteer-based organizations. I agree and have for years pushed back against the trend - but often felt like a lone "fun sucker". Politicians have a seat on this bandwagon too making it harder for organizational management to opt out of these "opportunities". What is actually accomplished? Well, many of these websites have generated quite a contact list of volunteers. Hope they aren't selling those volunter lists to folks who would like to mine for donations.